I returned home from my stay in the hospital, feeling much — MUCH — better. Imagine my surprise when I looked into the garden and saw all of the terra cotta pots lined up like the upstairs/downstairs servants on “Downton Abbey” greeting the arrival of the lord of the estate. Actually, I had arranged them before the health hoopla for a post on my love of terracotta. My idea was to call it a family portrait with some smarmy comment about it beging so hard to get everyone together for a family photo. But with days and days spent in the hospital, as well as all of the doctors and tests, I had forgotten all about that photo shoot and that post. Oh, well. You know what they say about best laid plans. In any event (and in my own warped mind), it was flattering to think that the terra cotta team thought as much about me as much as I do of them. I really don’t know where this affection for terra cotta began. I just know that I like the color, the feel, the texture, the variety, the warmth, the weathered age. When I see them in the garden, I am reminded of sun-splashed Meditteranean vacations, where whitewashed walls are the perfect backdrop for terra cotta pots overflowing with red geraniums. Gardening in terra cotta is tricky because the soil dries out rather quickly, which somehow seems appropriate for a material that translates to “baked earth.” I have learned to keep the terra cotta pots in shadier parts of the yard — and for that, I am rewarded with moss growing up their sides. Then, there is the matter of a Zone 6 winter and having to store them away. After I removed the plants and empty out the dirt, I let them dry in the sun so that I can remove any excess dirt. Afterwards, they are tucked into any available space: in the potting shed, up in the loft, in the garage — any place that will keep them safe from freezing and shattering. If I had to pick a favorite piece, it would be the large strawberry pot, just left of center. I usually fill it with Impatiens or Petunias, anything that will tumble down the sides. Because it’s so deep, I insert a pvc pipe with holes drilled down its length into the center, adding potting soil around it and planting each level of pockets as I go. Then again, I am also fond of the large pots that I found in a Home Depot while driving through Florida; of the four large pots that were picked up (on sale) in Costco; of the smaller ones that were found in a local barn sale; of the shallow platter on the right that I hoped would be a ground level bird bath (in reality, the dog likes to drink from it); of the cement acorns that make me smile each year. Every pot — every garden — every gardener — has a story. And when the weather warms again, I will happily bring the terra cottas out of storage and greet their arrival as the lords and ladies of my not-so “Downton Abbey” garden. I might even bow. Welcome home, Kevin! So happy to hear you’re felling better. I’m glad to see your stay in the hospital hasn’t hurt your sense of humor (or your desire/ability to “blog”. Upon looking at the photo of your terra cotta display, the first thing that caught my eye were the cute acorns. They are whimsical and I think they are adorable! Anyway – continue to recover. I’ll talk to you soon! It’s great to be home — a relief to sleep through the night without having to be woken up for a blood pressure reading. Love your terra cotta family photo! And I especially love the very large pots with handles on the sides. Glad to hear you’re out of the hospital. Thanks! Those are the pots that were souvenirs from a Home Depot in South Florida. At the time, they weren’t available in my area. I love them when they’re planted with anything — not so much when I have to lift them for winter storage. Great to be home again. I love the pot shot. I was just released last week after spending over two months trying to heal some severe pressure wounds so I too am glad to be out. Thank you. One week was enough for me in a hospital — I cannot imagine months. Welcome home — and here’s to continuing to heal. I am sorry to read that you have been in the hospital, Kevin, and I am glad you are home now! I hope your health continues to improve. I sympathize with your efforts to relax in the hospital. It’s a noisy, stressful place. I’m a nurse that works with premature and sick infants, and we often have a ‘relaxation’ channel with all the nature scenes playing in our babies’ rooms. I doubt if the babies pay attention to it, but the theory is it calms the frayed nerves of the nurses! And I, too, wonder where the G is in HGTV! About this post: I love all your terra cotta pots! I searched all over for the perfect pot for a little fig tree this year. After much deliberation I decided on a large, classic terra cotta. You can’t beat it! I could think of a lot of other things to calm frayed nerves — like looking at a fig tree in a terra cotta pot. Positively Mediterranean! Welcome home! another Downtown Abbey fan – I’ll admit I’m positively itching for the new season to begin. That’s an awful lot of terracotta. When I lived on the west coast I had a number of terra cotta pots but now on the east coast I’ve stayed away from them just because of the potential for breakage. Good for you being so diligent about caring for them and storing them away. I hear the new season will begin in January — very near my other obsession, “Mad Men.” Two shows that will help me survive the long, cold, dark nights of winter — no friend of mine nor my terra cotta. Happy viewing! Well, they’re going to keep on grumbling because I’m not lifting anything just yet. 🙂 And we have a frost warning tonight. I completely agree. Many times, simple and breathing are better — and that sounds like something we can all learn from terra cotta. Glad you are feeling better, Kevin. Yes there’s something lovely about terracota….and they show plants off so well.. I ike the acorn shape ones…interestingshapes. Did you see the terracota “head” in my last blog…very quirky and cute..am about to plant something new in it.. Yes, I saw the head! Very cool and interesting and fun! Thanks for visiting! Hey, Kevin, I’m glad you’re back and hope all’s well. I share your love for clay (love when it mosses up). 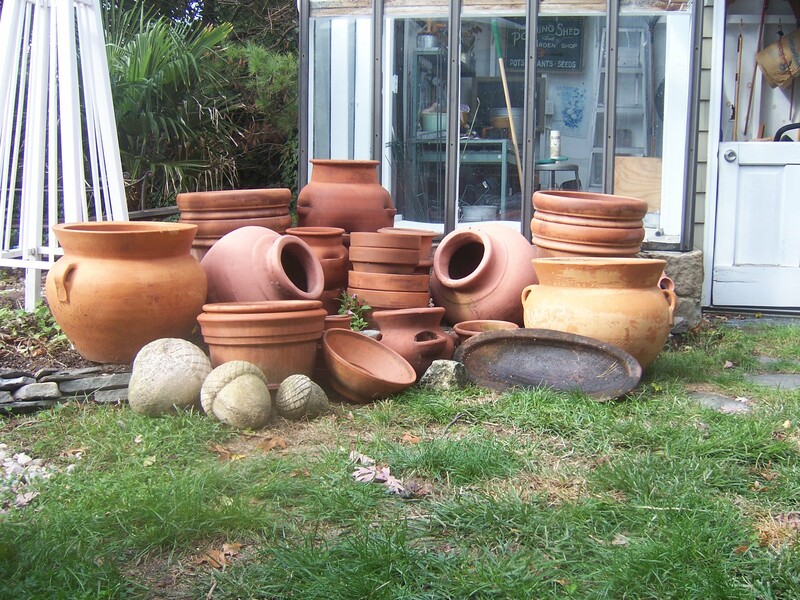 Even as my big pots get heavier and heavier each year, I cannot trade terra cotta for those lightweight pots. My plants would complain, and I’d miss the exercise. Lee, always nice to hear from you. Hoisting and lifting are a necessary evil when it comes to terra cotta — and when I question my sanity for loving the pots, the reward of their appearance and the flowers in them make me realize how happy I am to be crazy for clay. Kevin, Great post as you return to a more familiar environment. It is very enlightening to read of all the memories your pots evoke. What a wonderful window into the soul of a gardener that loves their containers as much as the plants. Lee, thanks for visiting my site and for your kind words. Like I said, every pot has a story to tell. . . Cheers! First time visiting and so sorry about all your health issues. Yes, the terra cotta pots are grand! Joey, I’m so glad you found me! I’m feeling much better — and the terra cotta pots are now packed away, far from the cold of today’s nor’easter. Cheers! I love terracotta pots but always break them! I need pots that bounce. :o) I’m glad you’re feeling better. If only terra cotta cold bounce! Thanks for the warm thoughts. We need them on a day like today. A great family portrait there, much better looking (and useful) than the Downton Abbey mob! 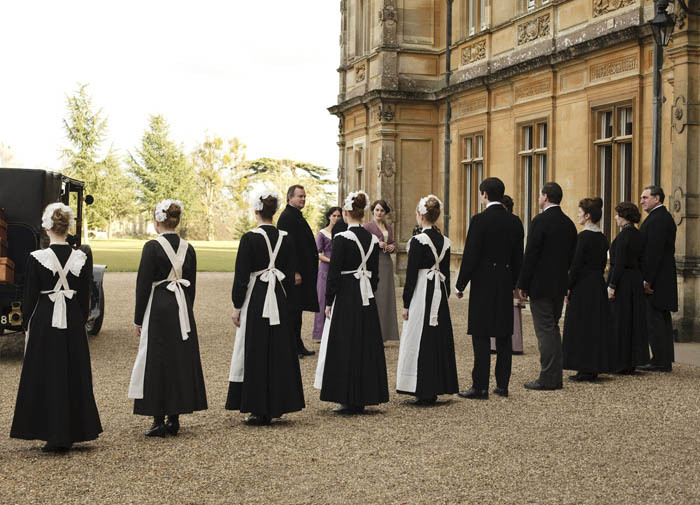 All so true — but the clothes on “Downton Abbey” are amazing! Thanks for visiting!